The tour bus will pick you up at one of the following locations at 11:00 a.m. If you are staying elsewhere, you may park at the airport or on Banyan Drive and meet at one of these locations. 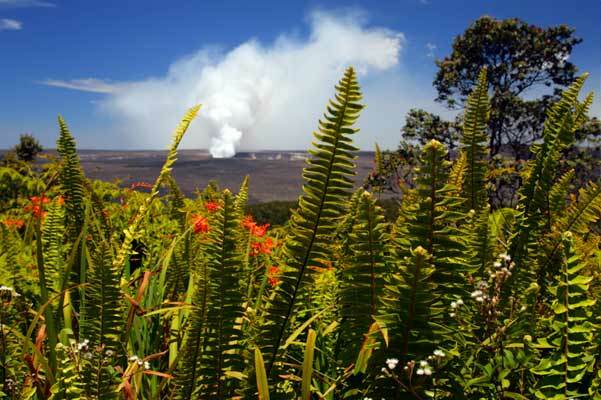 Explore Big Island volcanoes, flowing lava, and steaming craters on this Big Island adventure! 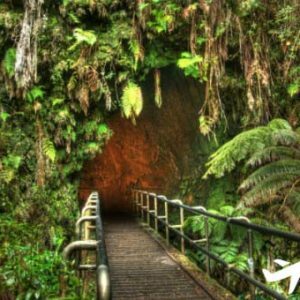 You’ll stroll through a giant 500 year old lava tube where lava once flowed. 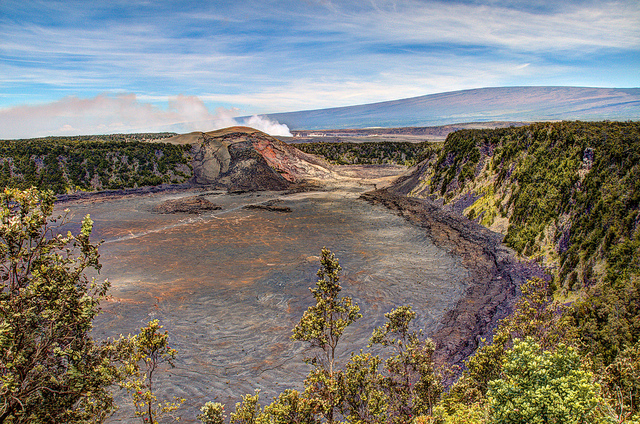 You’ll see how these volcanoes have shaped Hawaii and the Big Island landscape and still do! 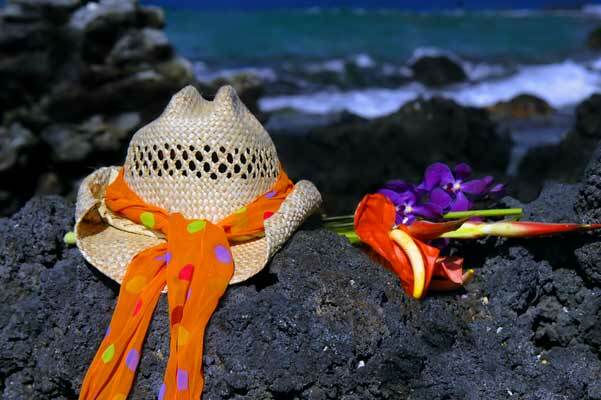 Black sand beaches, green sea turtles, and stunning mountain waterfalls await you! 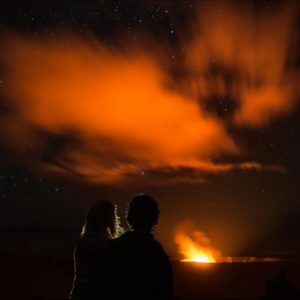 What makes this Volcano Tour special? 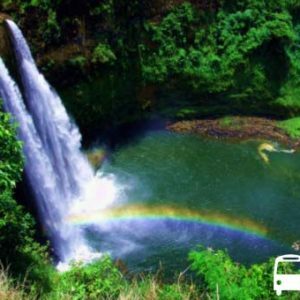 In one day you will visit the main sites of Hilo and Hawaii Volcanoes National Park. You will walk through a lava tube and go to the world’s most active volcano, Kilauea. 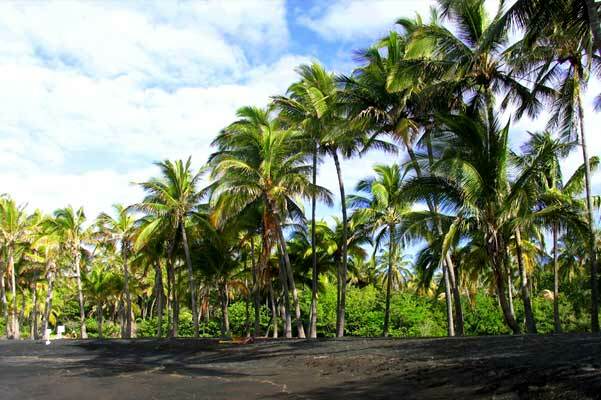 Begin with a stop at Hilo’s black sand beach, where we often see Hawaiian green sea turtles. 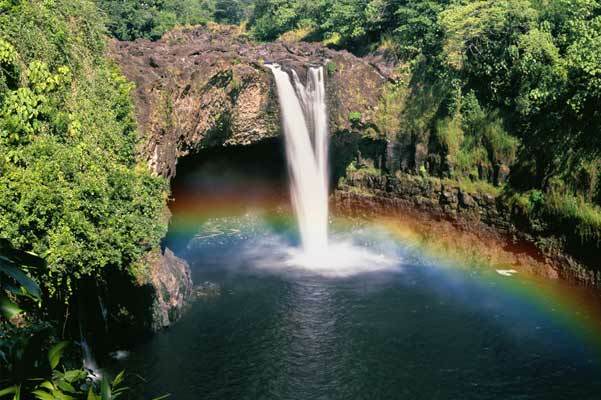 Then swing by Rainbow Falls for photos of this famous, picturesque waterfall. Stop for a snack at the Mauna Loa Macadamia Nut Factory and try fresh macadamia nuts. Then the volcano adventure begins. At Kilauea’s Jaggar Museum you will get a good understanding of Hawaii’s volcano culture and legends. 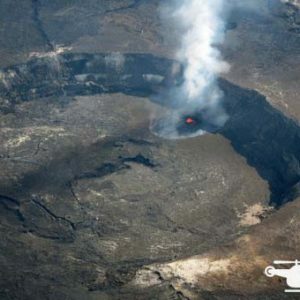 See the types of lava and the tools that measure the volcano’s activity. Then you will stroll though a 500-year-old lava tube, which is a cave formed when molten lava once flowed through it. 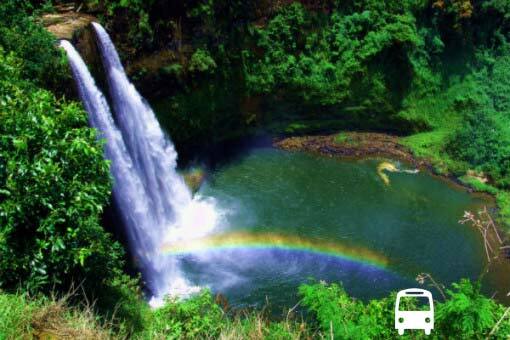 It is located in a tropical rain forest with impressive tree ferns and native birds. 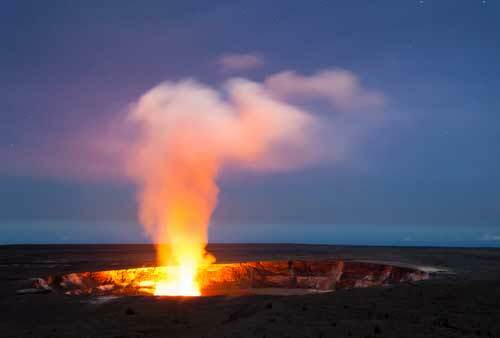 See Kilauea, the world’s most active volcano. Stand at the edge of Halema’uma’u crater to look for the glow inside. Nearby Mauna Loa is the largest volcano on earth. It last erupted in 1984 and is still active. If you have never been to the Volcano before, it is best to go with a guide. 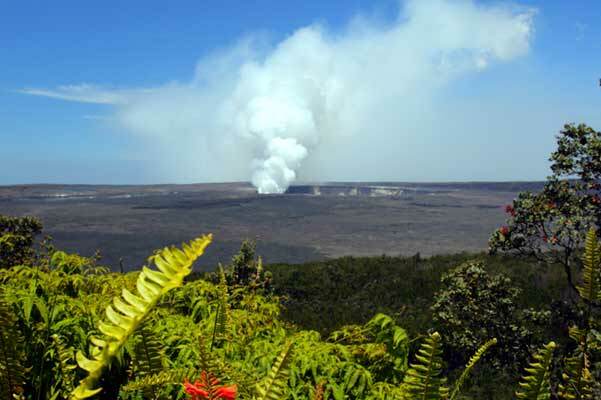 The Special Volcano Tour is the best way to see Hilo and the volcano, and learn about this fascinating location. 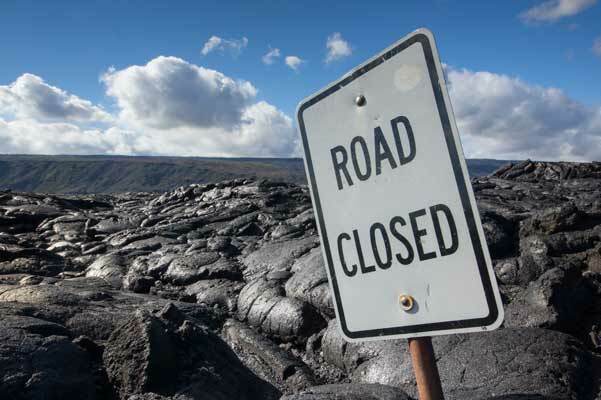 Attention: Modified Itineraries in effect until the Volcano National Park reopens to the public, please email info@hawaiivolcanoexpeditions.com for more information. Amazing display of Mother Nature. The view at night is unbelievable. Seeing the lava flowing is a once in a lifetime experience. I had bought a annual National Park pass that was good at the park, that was a plus. There is a lot of very different scenery along the way to enjoy on the way to the Jagger Museum and Volcanoes National Park. 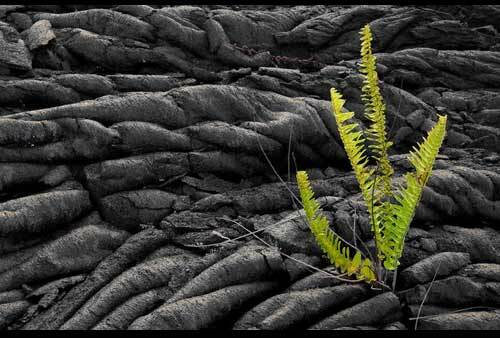 Once at the park there are a number of different venues to visit including lava tube, fern grotto, hiking trails and past historical sites. You will see mother nature creating vistas from the secret depths of earth. It is rather difficult to explain how spectacular the caldera of Mt . Kilauea and the halemaumau crater filled with hot red colored lava. What a spectacular view! We went right around sunset so the view of lava was great. Even caught the lava boat tours getting up close. Walk back was a bit tricky but all made it safely across the lava field. This was on my bucket list. The lava levels were up during our visit so we had great views from Jagger museum. The view of the lava going into the ocean is awe inspiring. Great experience with good friends! Walked down to the Thurston lava tube. Unfortunately because the flair of the tube was wet they did not turn on the lights. We only went in about 6 ft not having flashlights that were strong enough. But that was ok with us. 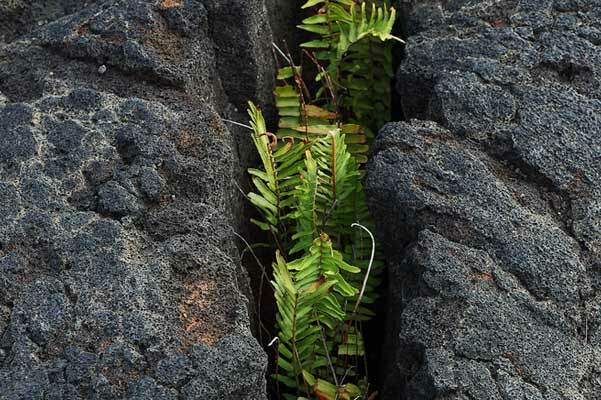 There is so much to do and so much to see: steam vents, Halemaumau caldera, rain Forest, lava tube, lava fields from previous eruptions, lava that has crossed the road, sea aarch formed when lave entered the ocean, and MORE. We viewed the caldera twice from the Jaggar Museum. We were lucky both times to have clear skies so we got quite a show each time. We also stopped at some steam vents. Sad to say some people have been throwing trash down them. We were so fortunate to see active lava in the caldera on our visit, so dramatic! Even on overcast and rainy day the volcano was impressive with it’s steaming plume. 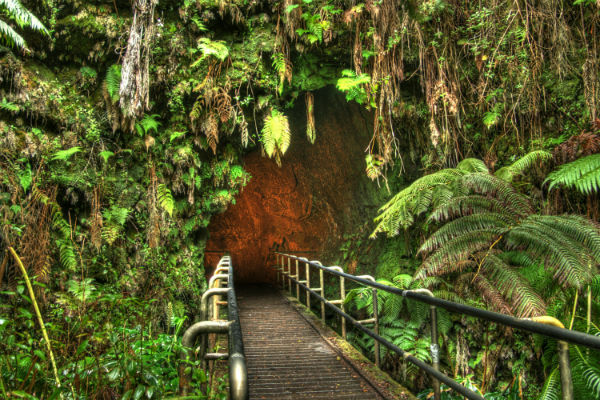 Take the time to walk the trails, visit the museum and hike through the lava tunnel. Could have spent more time here but we rushed on to Black Sand Beaches and Kau Coffee Plantation to complete a full day of touring. Awesome Day! My parents recently went on a Hawaii cruise and one of the ports of call was Hilo, HI. My parents were excited to see the Volcano National Park, so I booked this tour for them. This was my best find to date! The price was good and the timing worked out perfectly. They loved the tour and said Lori is a great tour guide, willing to accommodate special requests. My wife and I had a fantastic time on this tour! The tour guide was a lot of fun and super informative. I recommend this experience to anyone – young and old, especially if you’re planning on coming to the Big Island! Mel was our guide and he made our tour truly remarkable and memorable. He was very knowledgeable and most informative. All 8 of us in our group agreed that Mel gave us a fantastic and enjoyable tour. Wonderful day tour taking in the sights of the Lava Tube and Volcano. This is a must see!! Hearing or reading about is not same……you have to experience for yourself! You can not put into words the majestic views and sights you see here. Breathtaking beauty with a red stained glow beaming at you, drawing you in. We took this tour from C Big Island Tours. Our guide, Edmond, was just fantastic!! We went all over the Big Island seeing such sights as Rainbow Falls, Mauna Loa nut factory (where we had incredible ice cream). One of the highlights of our trip, walking in the crater of the volcanoe and going throught the lava flow tunnel!. Love this tour! Well worth it. The bus driver was very informative and funny also. You get to walk on old lava fields thru lava tubes. We didn’t get to close to the volcanoes because of too much sulfur. I would recommend this. We had a tour just my husband and I with Warren and it was a highlight of our Hawaii trip! He picked us up from Hilo airport and dropped us off for the flight back to Honolulu. Our driver was amazing, he was EXTREMELY knowledgeable. we could see the lava in the crater. this is interesting and worth the trip. they have rangers who give history and the latest happening at thee volcano. a fantastic tour of the volcano national park. black sand beach, steam vents and volcano museum. This tour does not include flights. If you are flying in to Hilo for this tour, please be aware that the tour does not wait for delayed flights and does not guarantee a return time for flight departures. We recommend purchasing the tour that includes flights so you do not risk missing your tour or missing your flights. The Volcano is at 4000ft elevation in a rainforest. We recommend bringing a jacket for warmth and rain protection.